Encoding for Ruby 2.3. We have added full support of encoding for Ruby 2.3 including all the newest language features. In order to encode for Ruby 2.3, please select an appropriate checkbox in your project settings or use the --ruby 2.3 option if you prefer to use the command line encoder. As usual you may combine encoding for different versions of Ruby but your code must be compatible with all the selected versions. rgloader/loader.rb starter script was slightly changed to refine detection of custom Ruby versions and two digits minor Ruby versions. The command line tools now return expected exit codes. The encoder returns encoding status after processing a single file. When it is processing multiple files it returns zero in case of running the process and if there are no issues in using the command line options and then you need to check the encoding log for further details. Licgen returns exit code on invalid options or status of the license generation. Rginfo returns exit code on invalid options or status of the encoded file. Please find further details in the Exit codes section of the updated user manual. 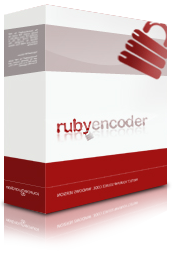 The dynamic loader code that is added by default to every encoded file now checks if RubyEncoder loader is already started and does not try to find and load it again. This may improve performance for nested protected files. You may exclude the default dynamic loader code from protected files if you are starting the loader manually from your other code e.g. if you want to start the loader from the custom folder. Please find the new option in GUI and command line for that. Please note, if you use this option you must start the loader before running the encoded file.